You are here: Home » MEDIA » Books » Halo: The Thursday War (book 2) by Karen Traviss (book review). Halo: The Thursday War (book 2) by Karen Traviss (book review). 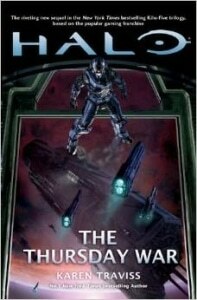 ‘The Thursday War’ is the second book in the Halo universe Kilo-Five trilogy that began with ‘Glasslands’. The story picks up soon after the events of Glasslands in March 2553. The prologue features Admiral Parangosky, the head of the Office of Naval Intelligence (ONI). It serves to summarise the events of the previous book and to describe the singular delights of ginger nuts. I think it succeeded admirably in both cases. I imagine that American readers might be slightly baffled by Parangosky’s predilection for biccies, but I suppose even a hard-bitten spymistress needs a little comfort food now and then. I was also pleased to read that the humble ginger nut had survived into the far future; aliens come and aliens go, but biscuits are forever. It’s a comforting thought. Kilo-Five’s black-ops mission to destabilize the Sangheili goes awry early on when team member Professor Evan Phillips is caught in an explosion on Sanghelios that was caused by another Covenant species, the Jiralhanae also known also as Brutes. They’re rebelling against the Sangheili, who in turn are about to engage in a civil war. While this is happening, other members of Kilo-Five discover that a human insurrectionist on the planet Venezia is the father of another member of the team, Spartan Naomi 010. Back on Onyx, now called Trevelyan, the captured Elite, Jul Mdama, is being used to test genetically poisoned Sangheili crops. Meanwhile, the UNSC Infinity a totally tricked-out warship looms in the background, foreshadowing the events of the ‘Halo 4’ game which was released November 2012. The ship has been upgraded with powerful technology left by the ancient and mysterious Forerunners. The tech is installed by a race created by the Forerunners called Huragok. They’re sort of floating, biological super-computers that, until recently, served the Covenant. You still with me? There’s a lot going on in this book. If, like me, you’re an impatient reader, you might want to have ‘Mortal Dictata’, the third book in the series ready to go for when you finish ‘The Thursday War’ because although there are a lot of plotlines, nothing big is resolved in this novel. It is most definitely the middle book of a trilogy. That isn’t to say that nothing happens at all. Plotlines introduced in ‘Glasslands’ are expanded and some branch off into side-plots and mini-arcs, but I did want some of them to be concluded in order to make the novel feel more complete. I felt at times that the story was a little thin for the galaxy-spanning canvas. I think, having read two of the trilogy, that the whole story is going to be best viewed from the perspective of having read all three. As with ‘Glasslands’, the prose is uncluttered. This is pretty much a necessity when dealing with a lot of facts from a well-established game universe but it can be a little too clinical at times. I like the various members of Kilo-Five but they felt a little too contemporary, rather than people from a few hundred years down the line. Some of the slang was very current which, to some degree, rooted the story in the present rather than the future. I don’t know how restricted Traviss was when it came to inventing even so much as a swear word, given that the novel is tied to a game franchise, but I think I would have liked more uniquely 26th century colloquialisms. Having said that, the soldierly banter does add depth to what could otherwise be very two-dimensional characters because of the constraints imposed by the game world canon. In ‘The Thursday War’, Traviss reduces the vast scale of the Halo universe. We still see the epic events taking place, but it is from the perspectives of individuals, both human and alien. This allows for greater engagement with characters that are, due to their martial background, somewhat constrained in their actions, even those who are engaged in covert ops are subject to strict military discipline. It’s still a middle book, the various plots are clearly building to a climax but, for me, there wasn’t enough of a pay-off at the end which left a feeling that the story arc of the novel itself was incomplete. Halo: Glasslands by Karen Traviss (book review). « The Shout (1978) (blu-ray film review).